Perfect for both lefty's and righty's, this scissor set includes two pairs of craft scissors that safely cut paper in either straight or zigzag lines! 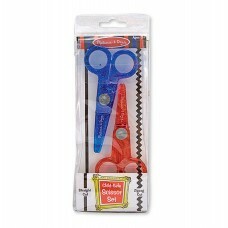 These scissors will not cut clothing or hair and are packaged in a plastic storage pouch for easy clean up. Recommended Ages: 3+ years (Adult supervision required).